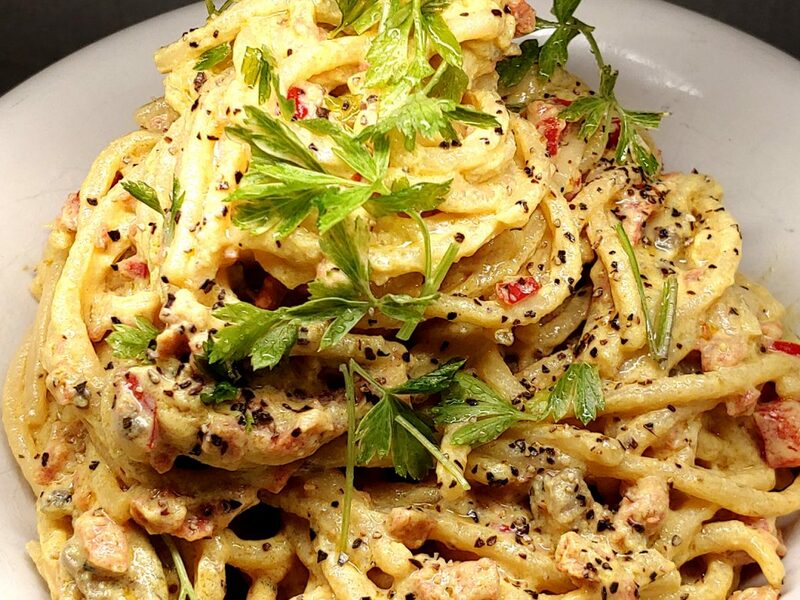 Pasta Carbonara used to be one of my favorite pasta dishes. Made with oil, eggs, bacon, and cheese. This is my healthy vegan version. Tofu with turmeric and black salt creates the perfect egg replacement. Nutritional yeast and spices create the cheese flavor and Imitation Bacon Bits replaces the bacon. In this version, I added sauteed mushrooms and minced red bell peppers. Combine all the ingredients in a food processor and blend until smooth. Set aside. Sliced Mushrooms of your choice. Saute the peppers and mushrooms together until the mushrooms reduce in size by half. About 7 minutes. Combine the pasta and sauce. Mix well.